Sometimes, the Goodtimes play to a packed room. Sometimes, an empty room. In their travels, TLG has discovered that you don't always get the crowd you desire, but you must ALWAYS play your heart out, no matter how many folks show up. Playing in front of 3 people is no different that 30,000--play that music like you mean it, like you wrote it, like you own it. And so they did, at Ashland's Club 66, and it was Good. First up was Medford's newly reborn (as a two piece!) SIP aka Survive in Peace. Everyone loves a heavy duo (think White Stripes, Local H, Black Keys...) and TLG loves SIP. These fellas bring a lot of energy and love to what they do, which earns them The Eternal Respect and Brotherhood of Struggling Musicians Everywhere. Our hats are off to these excellent Gentlemen of Rock. TLG played a full set, decked out in their finest Rock Regalia, with an extra helping of Sweaty Awesome Rock Poses. Though attendance was light that night, the boys gave it their all, and the Great Rock Spirits nodded in approval. Success. What about the very next morning? What was the band doing then, you ask? The band was back in Ashland the next day, inside a television studio. Matty J, runnin' in the shadows. Dave and Mark just before the final note of the session. Without giving away too much, the Rock was thrown down for the auditory and visual pleasure of all Earthlings. Stay tuned for some live videos of TLG, courtesy of Rogue Valley Television. Rock n roll in Rogue River! 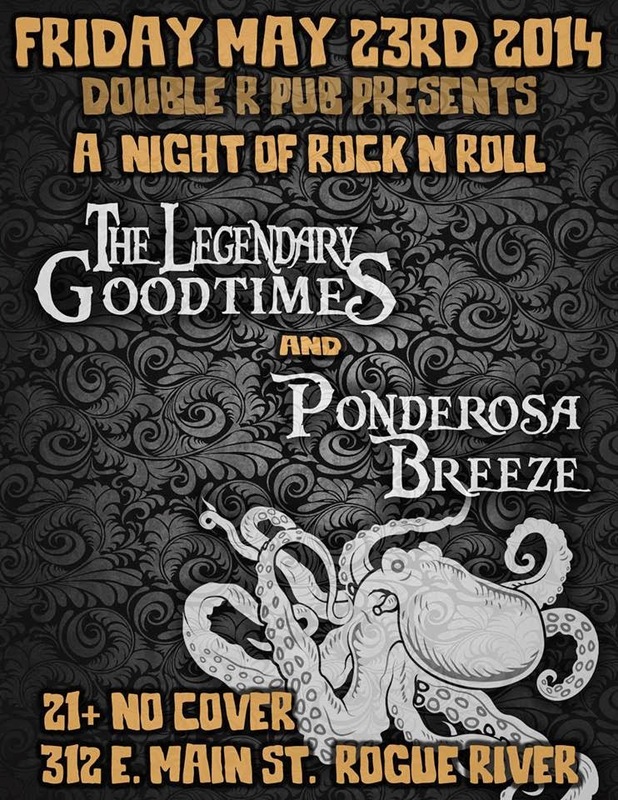 TLG returns to Rogue River on May 23 @ Double R Pub!! They will be joined by Southern Oregon's Ponderosa Breeze. Come quaff beverages and hang with the band! And that is all. Check back soon for more hijinks. The Legendary Goodtimes believe in Random Acts of Kindness, so when word came that The Chive was holding a unofficial meet-up and charity fundraiser, the guys were stoked. What could be better than hanging out with super cool Southern Oregon music folks and raising money for good causes? Black Ink Breakdown filling ear holes with excellency. By the time TLG took the stage, The Rockytonk was overflowing with handsome Chivers and gorgeous Chivettes. The love was in the room. Comforting pictures of Bill Murray were in abundance. Prizes were raffled, items were auctioned, and a Really Good Time was triumphantly had by all. Huzzah! Left to right: Matt Jameson, Sparklehorse Unicorn Moore, and Mark Anderson. Then, without warning, Dave transformed into a majestic unicorn. Everyone swooned. The Legendary Goodtimes (and The Masters of the Universe) return to Ashland! 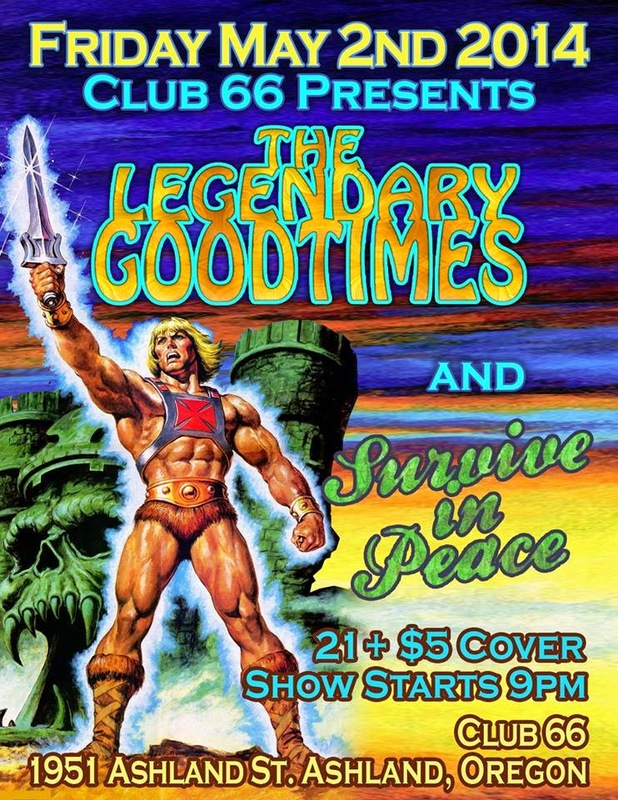 Come back soon to see what TLG and Survive in Peace did at Club 66 last weekend!